A Russian company is jumping on the hypersonic weapons bandwagon, claiming it can design a high powered bullets that travel nearly twice as fast as current sniper rounds. The company, Lobaev Arms, believes it can field the weapon within a year—with a little government funding, of course. In an article on the Russian state-operated news site RIA News, Lobaev Arms claims it can develop a bullet designed to travel at 2,000 meters per second. That’s the equivalent of 6,561 feet per second, or Mach 5.83. The cartridge would not use gunpowder but instead “detonating chemicals of a special composition”—whatever that is. An ultra-high velocity sniper round would be useful not only in extending a sniper’s reach but shorten bullet travel time and help negate gravity’s pesky effects. Most bullets travel at speeds between 1,000 feet per second and 3,000 feet per second. Among sniper rifles, velocity is prized because it it helps overcome the effects of wind and gravity. All bullets can be blown off target to a significant degree by the wind, requiring the shooter to compensate with his or her aim. Fired it a straight line a high-powered rifle bullet will travel for miles, but the nagging effects of gravity starts slowing a bullet down the moment it leaves the gun barrel. Eventually it will come to a complete stop. As the bullet gradually slows down it begins to fall vertically at a predictable rate known as “the drop”, which a shooter can compensate for. Belgium Army sniper team at the Special Training Centre High-Angle/Urban Course at the Hochfilzen Training Area, Austria. An extreme example—but one that helps illustrate the challenges snipers face—is the world record shot taken by two Canadian snipers against an ISIS target in Iraq in 2017. The snipers, stationed on a high-rise building, took the shot at 3,773 yards. At 2.2 miles, snipers need to take into account the effects of gravity, bullet speed, the wind speed and direction to the target, barometric pressure, temperature and humidity, and even the spin of the Earth. The bullet took 7.3 seconds to reach its target and was calculated to lose 6,705 inches of altitude—which explains why the Canadians were on a high-rise. What is the advantage in a hypersonic bullet compared to other bullets? A bullet that shoots “flat”—bucking the effects of gravity and wind to travel a comparatively straight path—is obviously desirable. Although bullet drop is easily calculated wind is considerably trickier and gets harder to account for the greater the distance. A hypersonic round will shoot very, very flat, though it too will be eventually affected by gravity and environmental conditions. A hypersonic round also travels faster, giving the target less time accidentally wander out of the bullet’s path. Enter Lobaev Arms. Founded in the Kaluga region of Russia, the company manufactures bolt-action sniper rifles with scary-sounding names like the “Twilight”, “Stalingrad”, “Harasser”, and “Saboteur”. The company’s website says it has supplied rifles to the United Arab Emirates, Russia’s Federal Protective Service (Moscow’s equivalent of the U.S. Secret Service) and the Federal Penitentiary Service. 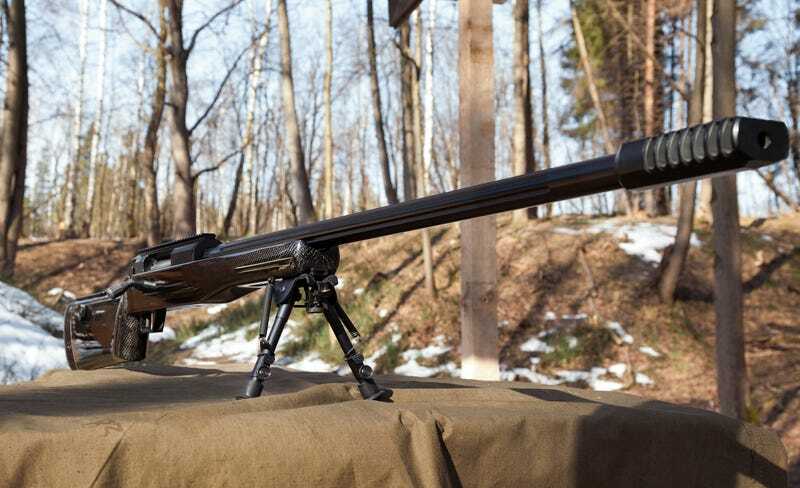 The company, founded by brothers Vlad and Nick Lobaev, prides itself on the accuracy of its rifles. A hypersonic bullet doesn’t mean that Russian snipers will automatically out-range their Western counterparts. The primary advantage of a hypersonic round—the ability to defy gravity and wind—will only good be for so far of a distance. After that it will act like any other round, requiring the shooter to make precise adjustments in order to strike the target. Is a hypersonic bullet even feasible? Actually, yes. In the 1930s, the U.S. Government experimented with very high velocity bullets. Springfield Armory, then a U.S. government small arms research and production facility, reached experimental velocities between 8,500 and 9,000 feet per second. That’s considerably faster than what Lobaev is aiming for. High velocity weapons are subject to frequent maintenance and repair: the tremendous pressures necessary to force a bullet out of a barrel at very high velocities wears out gun parts at a rapid rate. Civilian target shooters must balance their budgets versus the desire to shoot high velocity ammunition. A more suitable comparison might be an electromagnetic railgun: railguns sling projectiles to speeds of up to Mach 6 and until recently, required barrel changes after just tens of rounds fired. Is there a military application for a hypervelocity sniper rifle? There’s always an application for a weapon that shoots like a laser to certain ranges, but use would be extremely limited. The cost of the weapon—and ammunition—will be considerably more than a traditional sniper rifle. A hypervelocity sniper rifle will need frequent and expensive barrel changes, limiting their issue to only the most elite troops. Depending on the cost-benefit analysis, the number of troops issued a hypervelocity weapon could be as high as zero.